Ninu Veedani Needanu Nene' stars Sundeep Kishan in the lead. Directed by Caarthick Raaju, the film has Anya Singh as the female lead and has Thaman scoring the music. Its intriguing First Look was unveiled recently and caught the audiences attention. The makers have now come out with a 1st of its kind contest for all the movie Lovers out there. 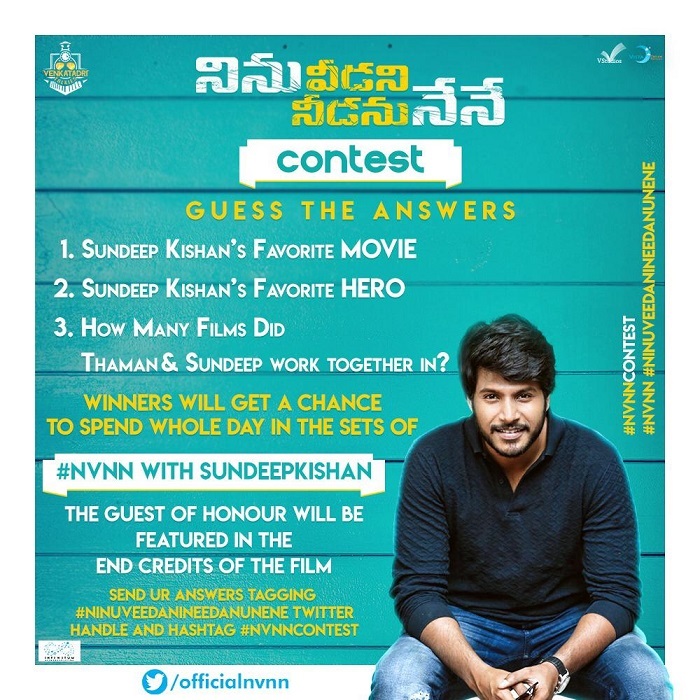 Here are the details of the #NinuVeedaniNeedanuNene contest. 1. What is Sundeep's favourite movie? 2. Who is his favourite hero? 3. For how many films have Sundeep and Thaman teamed up so far? Send your answers using the hashtag #NVNNContest & mention @officialnvnn in your response. The novel project is being produced by Sundeep's home banner Venkatadri Talkies as Production No. 1. He has teamed up with producer Daya Pannem and Subbu Narayanan of V Studios for this. cinematography is by Pramod Varma, editing is by KL Praveen (National Award winner), and art direction is by Videsh. Executive Producers are Siva Cherry ,Seetharam & Kirubakaran.